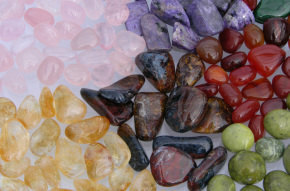 Around 200 different types of tumbled stones are available from Ron's Rocks. They are AA grade, with a high polish - not everyone will offer you the quality AND the selection. We do our best to offer you both. Here's a selection of some of the more unusual tumbles we stock. There are two pages of tumbles below - click on an image for a close up.